Oh, oh. The people who came after Noah were at it again. How quickly they forgot that everything they had came from God. And God is far, far more wonderful than they were. And so they all agreed. And, the thing was, they COULD all agree, because in the time after the flood, everyone spoke the same language. So one day God came to visit the magnificent city the people were building, and to see the great tower. This isnt good, God said. Because they all speak the same language, there wont be anything they cant do! And so right then, God began to confuse the language of the people on earth. People started calling things by different names. Hand me that hammer, one worker said to the other one day under the hot sun, while they were working together way up on the tower. And the other worker handed him a brick instead. He didnt know what the other worker was talking about anymore. (Have you ever noticed how we always think there is something wrong with the OTHER person when they cant understand us - and that if we just speak LOUDER they will!). Well, they couldnt get much work done like that! And soon the people werent getting along so well anymore. They quit building the great city and the tower. All the people that spoke one new language decided to get together and move to a new place, while the people who spoke another language went to find a nice place somewhere else. And because of that, people began to move all over the earth. So the magnificent tower never got finished. 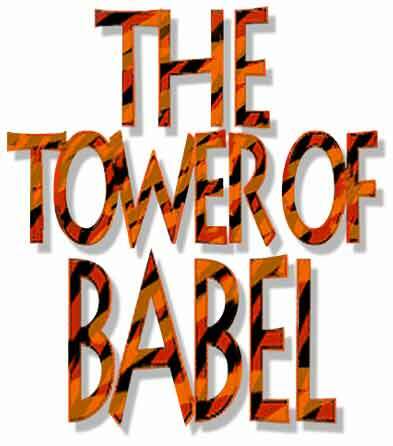 It became known as the tower of Babel (Babel is like the Hebrew word for confusion), because thats where God made all the peoples language sound like babbling to each other.